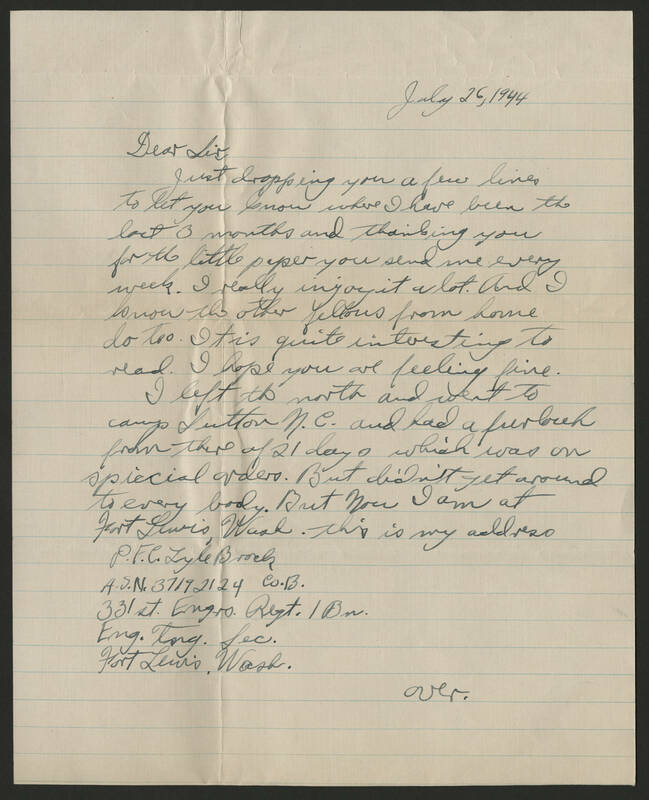 July 26, 1944 Dear Sir, Just dropping you a few lines to let you know where I have been the last 3 months and thanking you for the little paper you send me every week. I really enjoy it a lot. And I know the other fellows from home do too. It is quite interesting to read. I hope you are feeling fine. I left the north and went to camp Sutton N.C. and had a [illegible] from there of 21 day o which was on special orders. But didn't get around to every body. But now I am at Fort Lewis, Wash. this is my address P.F.C. Lyle [Brock?] A.S.N. 37192124 Co.13. 331 st. [Engro?] Regt. 1 Bn. Eng. [tng?]. Sec. Fort Lewis. Wash. over.